By Taali Lester Tollman--The way I see it, you'd be hard pressed to find a Jewish community that cares more passionately about the people of Israel than Toronto. For over 25 years the personification of that passion has been felt through UJA Federation and its Israel and Oversees Committee, a group of lay leaders that have helped UJA Federation transform the social landscape of Israel, enabling dramatic changes that have strengthened both the people and the country. 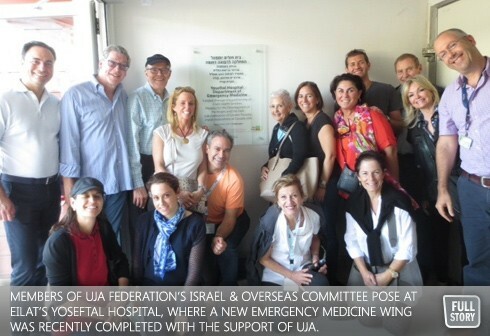 I recently had the opportunity of joining this unique Federation committee, led by outgoing Chair Irving Granovsky, current chairs Henry Morton and Debbie Kimel and vice chair Honey Sherman, as they traveled on an information gathering mission to Israel. It was an extraordinary experience, not only to learn about the initiatives and projects that have been designed and implemented, but also to better understand the incredible innovations Federation has pioneered in the area of strategic philanthropy. Israel has evolved at an accelerated rate over the last 65 years. It has gone from a fledgling country fighting for its very existence to a dominant power in the region, leading the world in high-tech and entrepreneurial innovations. And over the last 25 years UJA Federation has been evolving its philanthropic strategies to keep pace with the current needs of the country while remaining relevant. Not content to merely allocate funds and leave the heavy lifting to others, Federation's Israel & Overseas Committee has consistently worked in partnership with Israeli governmental organizations like the Jewish Agency for Israel, the Joint Distribution Committee (JDC), local municipalities, Israeli philanthropists and foundations to leverage dollars and brainpower, making transformational changes in infrastructure, education and health. Today, UJA Federation's fresh approach to philanthropy is illustrated through their commitment to strengthening the peripheral regions of Israel, cities detached from the centre of the country that lack resources and social infrastructures to ensure a good quality of life for their citizens. In UJA Federation’s partnership community, the Eilat/Eilot region, which sits at the southern tip of the country, Federation's Israel & Overseas Committee has been working to implement strategies that will transform the region from a sleepy, under-populated tourist destination to a bustling city, a destination for industry, science, technology and medicine. This of course is no easy task, one that will take a multi-pronged approach, many local partners and a clear vision. At the centre of this vision is a focus on education and more specifically the promotion of STEM subjects (Science, technology, engineering and math) in schools in low income and under-resourced neighborhoods. There are many challenges with implementing the vision and this Federation committee is now engaged in addressing some of those issues, namely a regional deficit in science and math teachers and severe infrastructure and funding constraints. Contributing seed money and incubator dollars for innovative programs that could break down socio economic barriers, the Federation believes that offering a hand up rather than a hand out will make the difference between long term dependency and self sufficiency. Federation is also working on strategic initiatives to bridge economic gaps in the cities of Sderot and Bat Yam. Again education is at the core of the strategy, with work being done to develop teachers' skills, students’ interest in the STEM subjects and parents’ ability to support their children's educational journey. In the 21st century the Diaspora's relationship with Israel is continually being redefined. Israelis are turning to communities worldwide to partner with them on innovative projects that will reshape the current structure and set Israel on a path for success. What is clear is that UJA Federation is at the forefront of this redefinition, and through its Israel & Overseas Committee, impassioned donors are making revolutionary changes that will lead Israel into the next century. Taali Lester Tollman is VP Marketing, UJA Federation of Greater Toronto.